IWCP - 22 February 1919 - KILLED IN ACTION ETC. - FLUX. - Feb. 13, at King George V. Hospital, Dublin, from influenza, Pte. 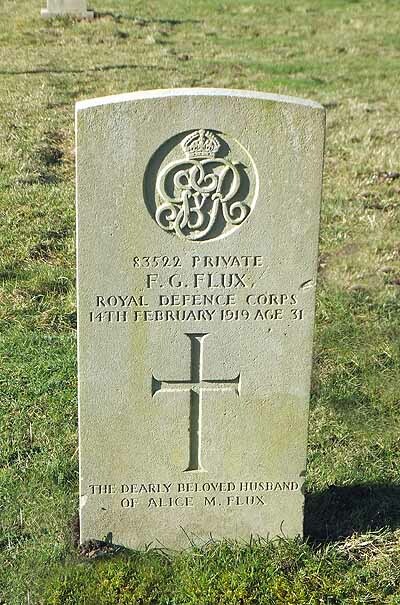 Frederick Flux, the beloved husband of Alice Flux, of 9 Clifford-street, Newport, aged 30 years. Mrs. Flux and her sisters (Mrs. Jacobs and Mrs. Benjafield) wish to thank kind friends and neighbours of Clifford-street for sympathy shown them, and especially to thank Capt. H. Linington and the military present.